n. Swiss German 1. the freezing of a lake. 2. a frozen lake. 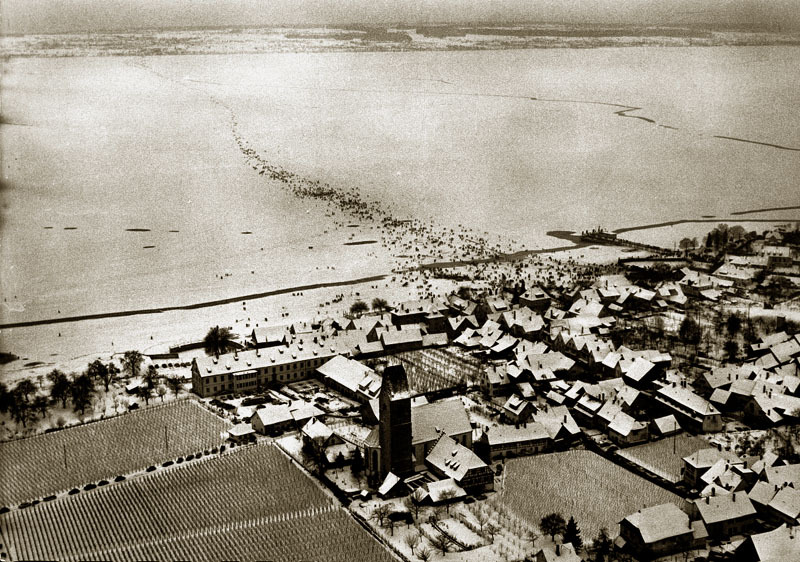 The last time that the Bodensee completely froze over was in 1963. The natural spectacle of the freezing of the Bodensee, known as Seegfrörne, has been recorded in history with at least 35 occurrences. The earliest known Seegfrörne can be traced back to the year 875 from chronicles and since the thirteenth century from more reliable sources. Because the complete freezing of the lake is a seldom occurring natural phenomenon and due to the high attention in the media to the 1963 Seegfrörne, it is not surprising that this “once-in-a-hundred-year” event has become part of the local lore. Particularly for those who had the opportunity to experience it, it constitutes a once-in-a-life-time experience. 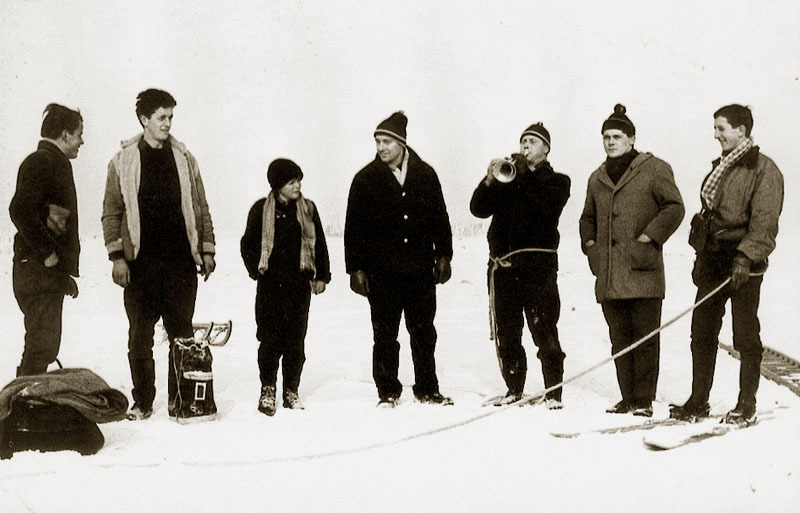 Two groups of men from the Baden community of Hagnau were the first to find the courage to cross the frozen Bodensee. In the stories from the “first-crossers,” the constant presence of danger is emphasized since they could not be certain that the ice would carry them. Despite this danger, the huge sheet of ice exerted an unbelievably strong fascination in those living on the lake and beyond. Though the Seegfrörne only lasted a few weeks, the event has had a lasting effect on the memories to this day. The frozen lake literally built a natural bridge between those living on the neighboring shore and temporarily removed the dividing element of the lake and let a new friendship between the Germans and Swiss arise. The highlight of the Seegfrörne was depicted in the so-called Ice Procession on February 12, 1963. Part of this procession included the custom of carrying a wooden bust of Saint John the Baptist in a festive parade from one shore to the other, where it rests until it can be carried back during the next Seegfrörne. In face of global warming, it is a bit problematic to predict the next Seegfrörne. For this reason, the last Seegfrörne continues to be of great importance in the collective memory of the Bodensee region. Copyright © 2019 GrenzRaumSee. All Rights Reserved.